1 Combine crab meat, Hellmann's® or Best Foods® Real Mayonnaise, lemon juice and peel, olive oil, chives, watercress, tarragon, parsley and garlic in medium bowl. Season, if desired, with salt and pepper to taste. 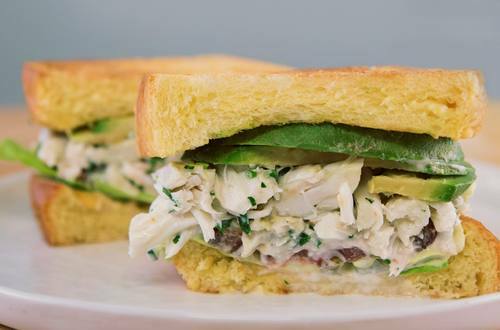 2 Load 4 slices toasted brioche with crab salad, tomato, lettuce and avocado. Top with remaining brioche. Enjoy!